We had so much fun this past weekend at the Hapey Memories cabin (pronounced happy) when we teamed up with Hapey Cabin Rentals! Clay and I headed to Tennessee with his sister and her husband for a weekend getaway. We loved the cabin and plan on going back very soon and taking our kids. They were all under the weather this past weekend so we let them stay with their grandma instead. The owner is incredibly nice and super helpful answering any questions I had about our stay. Response time was fast too! She is absolutely wonderful to work with! Let me tell you more about this cabin and be sure to check out page 2 of this post. There’s photos of everything I mention in the post as well as a ton more! 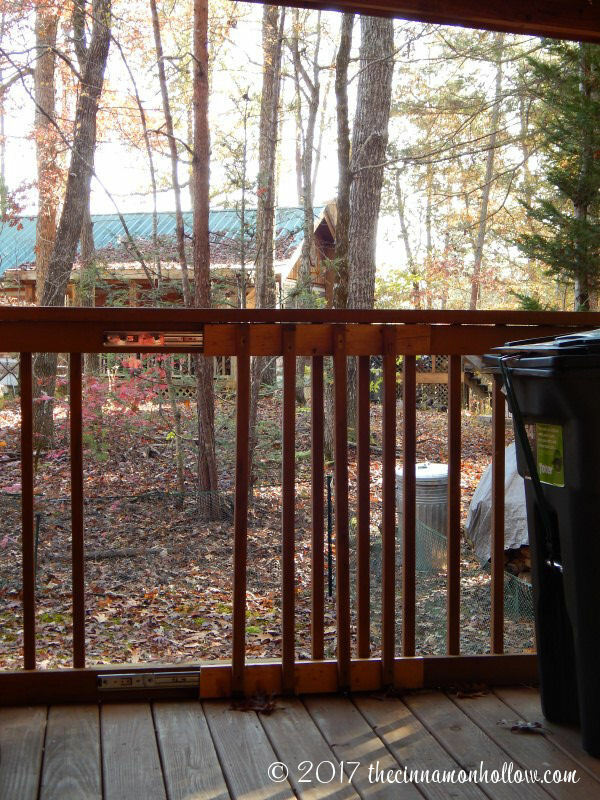 Ok, so Hapey Memories is a 2 bedroom, 2 bath cabin rental in the Great Smoky Mountains. This cabin is extremely pet and family friendly so if you plan on taking your fur kids and/or your human kids, this is the place for you! 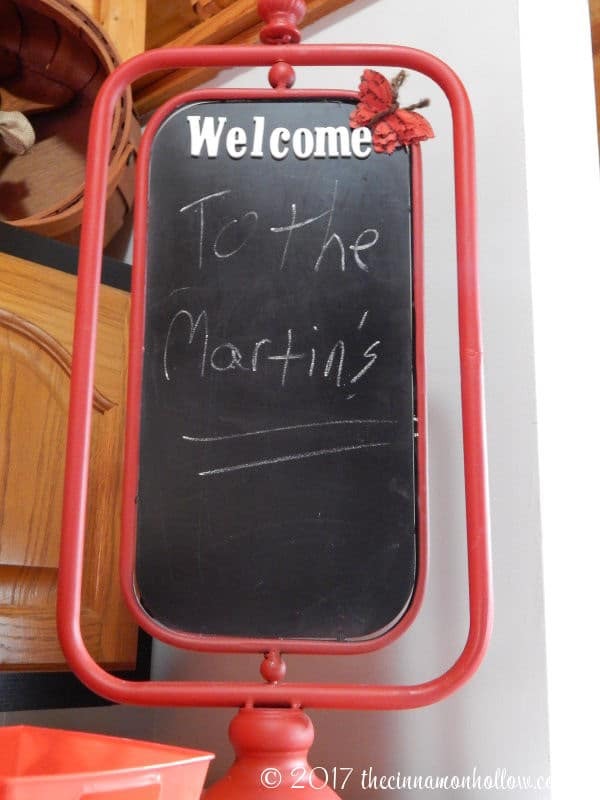 We were welcomed with a sign that had our name written on it, on top of the refrigerator. What an awesome personal touch! The end of the deck, beside the fenced yard, has a little sliding gate and stairs. 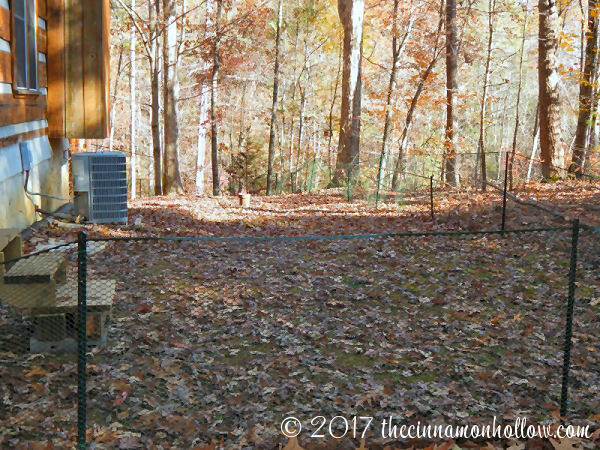 All you have to do is slide the gate open and your dog can go in and out of the yard. The front deck also has sliding gates so when you are enjoying the rocking chairs on the front porch, your pup can go from the deck to the yard on its own. There are pet feeding bowls beneath the kitchen sink as well as dog treats in an adorable bone shaped dish. 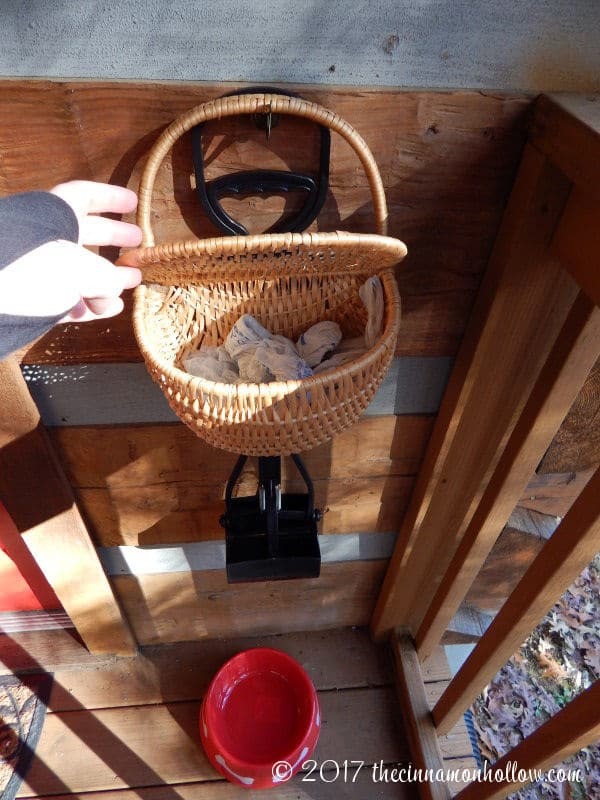 This cabin is truly pet friendly. 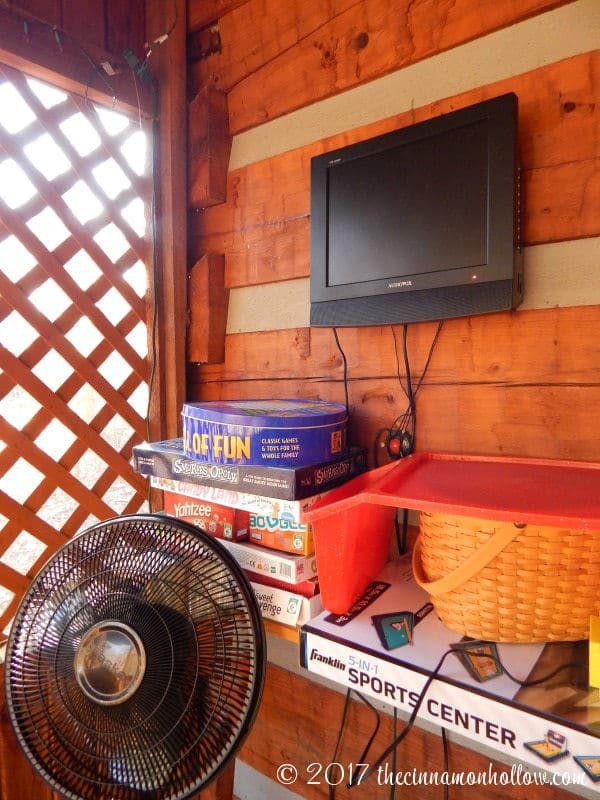 For the kids, there are tons and tons of books, movies, board games and even a video game that can be plugged into the tv out on the back deck. There are more books and things than what’s shown in the photo below. Clay and I plan on taking our girls to this cabin very soon. They are going to love it! 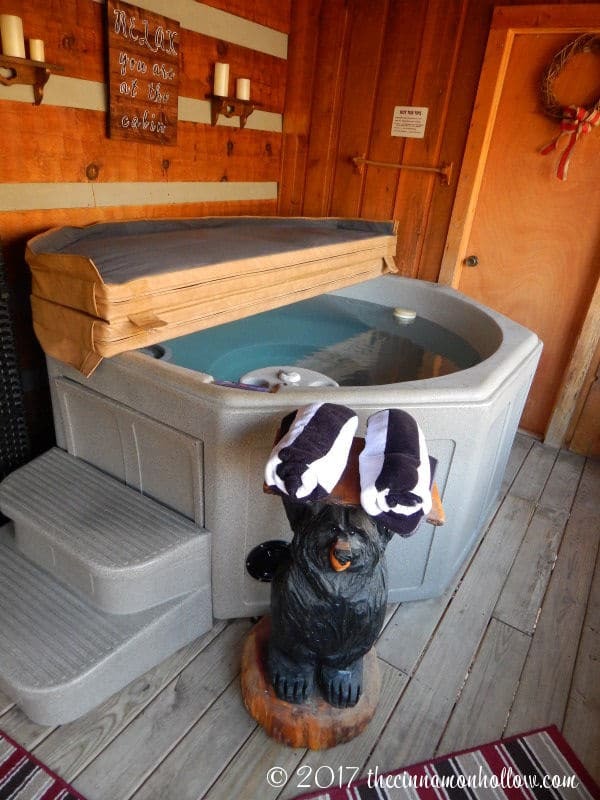 You will also find a wonderful hot tub out on the back deck as well as a picnic table. There’s a door that leads into one of the bathrooms, to change clothing, so you can go directly from the hot tub to the bathroom without traipsing water throughout the house. The area above the hot tub is decorated nicely too with candles. Very romantic feeling! There’s a screen that covers a utility cabinet. You could use that for a little privacy in the hot tub to separate between it and the tv/picnic table area. 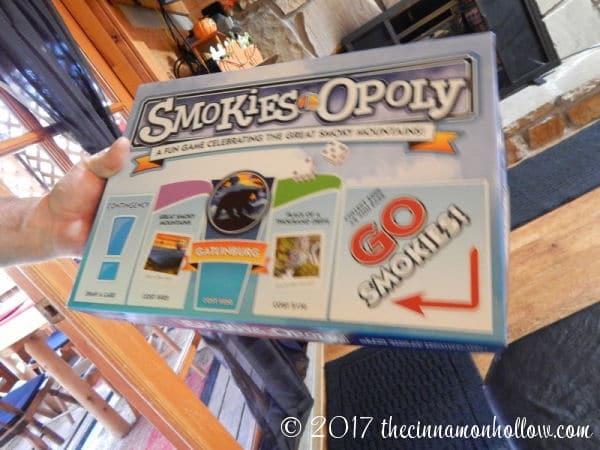 Families can sit out there and watch a movie, play a board game like “Smokies-Opoly” and relax in the hot tub.There’s plenty of lights, including white Holiday lights along the ceiling and a floor fan for the warmer months. There is so much here for the kids. We even received kits with a coloring book and puzzle! Everything is labeled too. 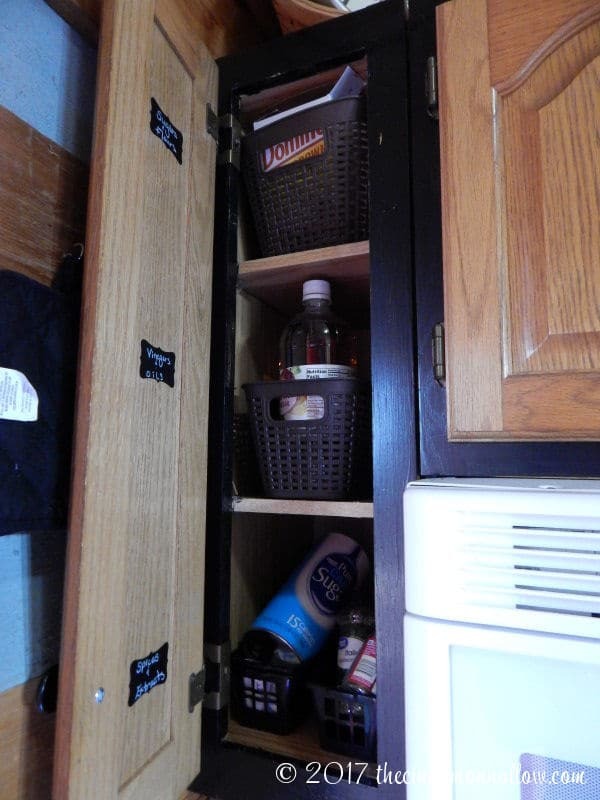 The cabinets have labels to show what is in there and where it all goes back. I adore labels so I was in heaven! Outside on the front porch of Hapey Memories was even bug spray and a citronella candle so you can enjoy being out there without all the mosquitoes and flies. This place is awesome! There is a washer and dryer closet in one of the bedrooms. 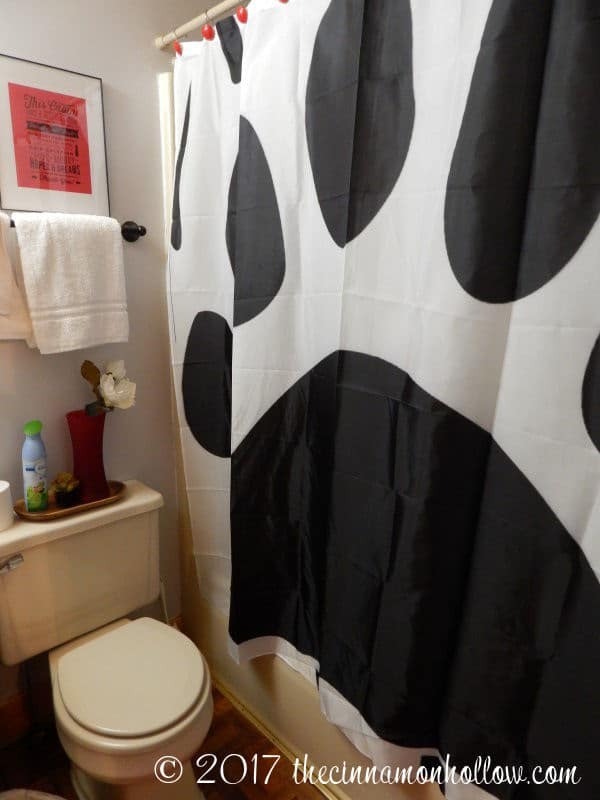 The curtain in the photo above covers this area and there is a starter supply of laundry soap, bleach and dryer sheets in there. Seriously, this cabin is so well stocked! Ok, the bathrooms. I don’t usually take many photos of the bathrooms or spend much time talking about them. I mean, they’re bathrooms. Not much you can say about them. These were a little different though. 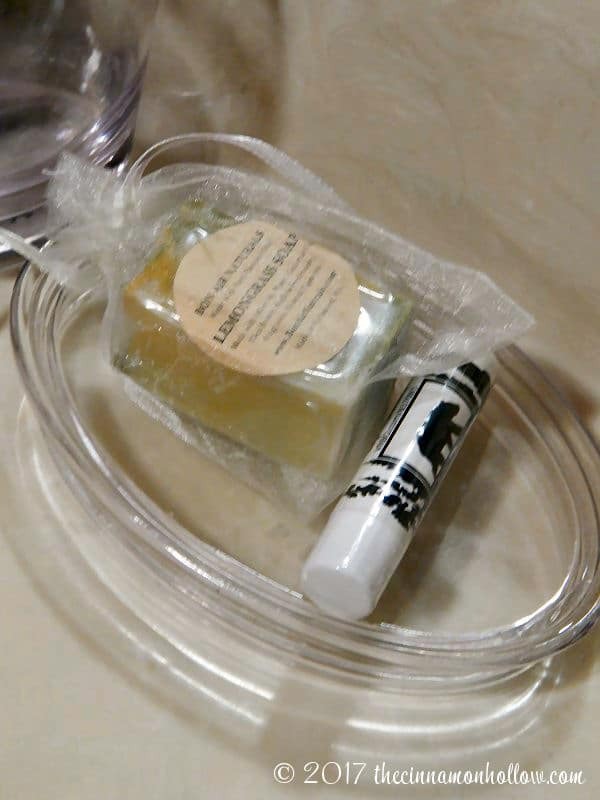 There was a handmade soap and lip balm from Bon Air Naturals in each that you can take with you. We were also supplied with makeup removing wipes. Not just a little packet either but a whole container! There was hand lotion and foaming hand wash and plenty of towels and wash cloths along with a can of air freshener. There were even cotton swabs under the sink in a little jar! They were decorated very nicely too. 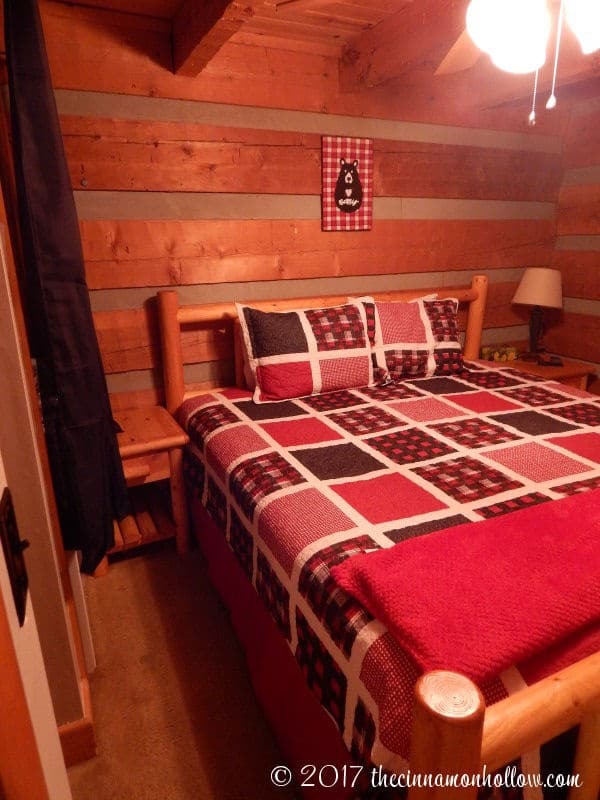 The entire cabin is decorated in red, white and black with photos of local black bears here and there. It is so adorable and I am definitely ready to go back and stay again. I wasn’t ready to leave it in the first place. Sunday came around way too fast! I have a lot of photos for you, in a slideshow. To keep the page load time at a minimum, I’ve added them on to page 2. Click the button below to see the photo slides from our stay at Hapey Memories cabin. Seriously, there’s a gazillion so go have a look!